If you missed the renovation details, then checkout the Renovated Stone Farmhouse Before Tour Part 1 and the Renovated Stone Farmhouse Before Tour Part 2! This historic stone farmhouse’s 1970’s renovation is complete! Remember the obvious asymmetry of the house after the tree was removed (see here)? As this would have been too great of a structural undertaking just to center the windows and door (Insert my grandfather’s sad sigh here. See I came by the need for symmetry honestly!). Instead he added 5 columns to the front with the thought of visually creating a “new center” with the middle column. It is difficult to see in the after picture, but there is a cast iron pump just in front of the original log house that was still operational and was incorporated into the lower porch. The double garage with the kitchen above was added onto the house and would also connect to the 18th century log cabin. Little did my grandfather know how popular the white farmhouse style would become. Joanna Gaines was just a child when this farmhouse was renovated! View from the front of the house. Loved the pond. I used an wood plank out of this old barn to create a Farmhouse Style Cork Board Organizer. Read the DIY tutorial here. Road that ran along the left side of the house that led to the barn at the back. The original dining room became the master suite. It was also attached to it’s own bathroom which was located behind the photographer. The upstairs bathroom and the master bathroom had a laundry shoot that emptied into an old shopping cart in the basement. The original dining room which would become the Master Bedroom suite. The first picture where my mom is standing at the door is behind us in the second picture. My mom in her bedroom. Again, the first picture is behind us in the second picture. The formal living room with door way to hall on the right and door to formal dining room on the left. Shot of the family in the family room right after renovations in the 1970s. Whew. Gotta love the 70s. At the desk under the window there is a rope hanging directly to the left of the window. When my grandmother would have food ready, we would ring the bell that was added onto the roof over the kitchen that could be heard across the 100 acres to let my grandfather know to come in for lunch! You can see bell above the kitchen addition in the picture below. The kitchen part of the new addition. Loved the brick inlay recessed stove. What would be the formal dining room. Remember the original log house? Remember the original log house? Here is the fireplace from 1763. George Washington was President when the owners baked bread in here. The original cast iron door to the brick oven was discovered in that very spot as they torn out the brick and was incorporated back into the design. Few things inspire that sense of old world charm more than walls lined with books. 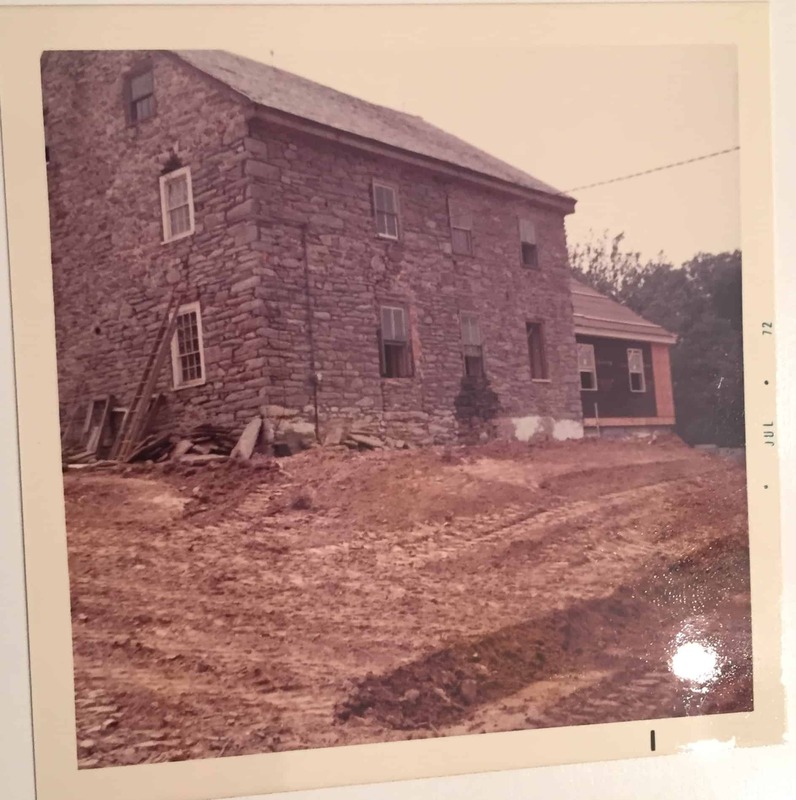 This farmhouse, built circa 1763 with over 100 sprawling hillside acreage, was purchased in 1972 for $90,000. After approximately $125,000 of renovations and 40 years of equity, this 4400 sq.ft renovated stone farmhouse was valued at approximately $2 million. The value of the “hammers” is evident as stated above, but the value of the “hugs” that came from hours of playing in the streams, picnics in the woods, riding the tractor, sledding on the toboggan slope, feeding animals in the barn, sleepovers in the playroom, homemade pancakes for breakfast . . . is priceless. What a fun post! Lucky family! I thoroughly enjoyed the 70’s photos! hehe! What a beautiful home and amazing transformation! Just amazing. That place is what dreams are made of.